Next to the Old Road entrance to Manor House Gardens, more or less opposite Bankwell Road, is a nondescript gateway; currently it is to a building site where work has been paused for a couple of years. 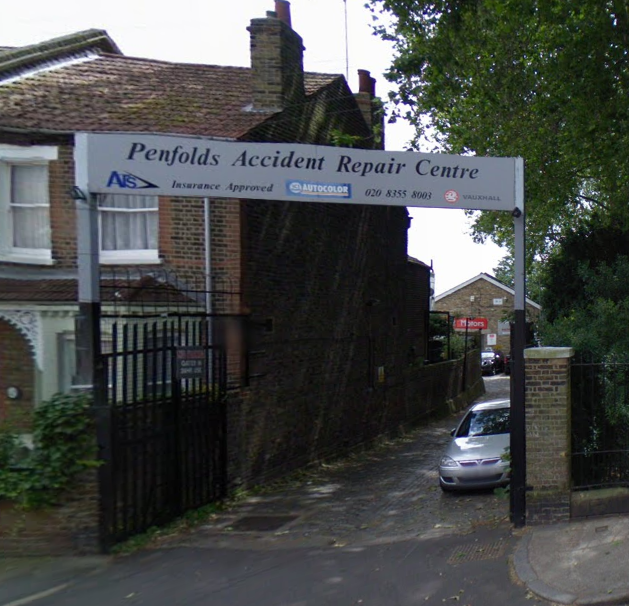 Before that, for 25 years or so, it had been home to the crash repair workshop of Penfolds Vauxhall dealership. It is a site with a varied history which will be explored here. The site had been part of the estate of one of the large country houses of Lee, Cedar House, which was on what is now the north western corner of Aislibie Road. It originally had an estate that the covered the western side of Aislibie Road, down to the Quaggy. James Halliburton Young, had lived there from 1841, perhaps a few years earlier, probably until his death in Ceylon in 1883; he had largely merged the estate with that of the neighbouring Lee House. Apart from the area around the Cedar House itself, the rest of the combined estate was sold for development in the 1880s. 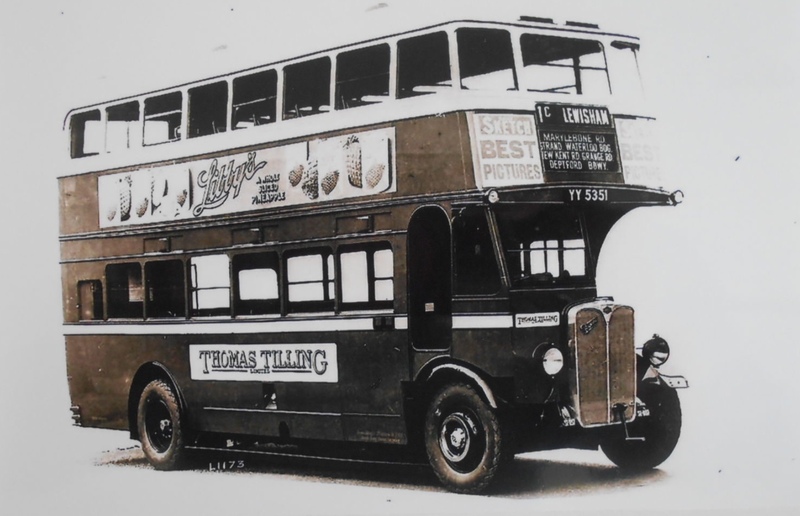 The first occupants appear to have been Thomas Tilling’s bus company, they seem to have moved into 36 Old Road soon after Cedar House had been sold. This was around 1901, or perhaps slightly before, when the use was listed as omnibus stables in Kelly’s Directory. Brandram Road, Carsten Mews, Lee Road, Lee Green as well as Old Road in Lee. They expanded into motor buses from 1904, which rapidly replaced horse drawn transport; horses only lasted another 10 years, when the remaining ones on a route from Honor Oak to Peckham were conscripted. 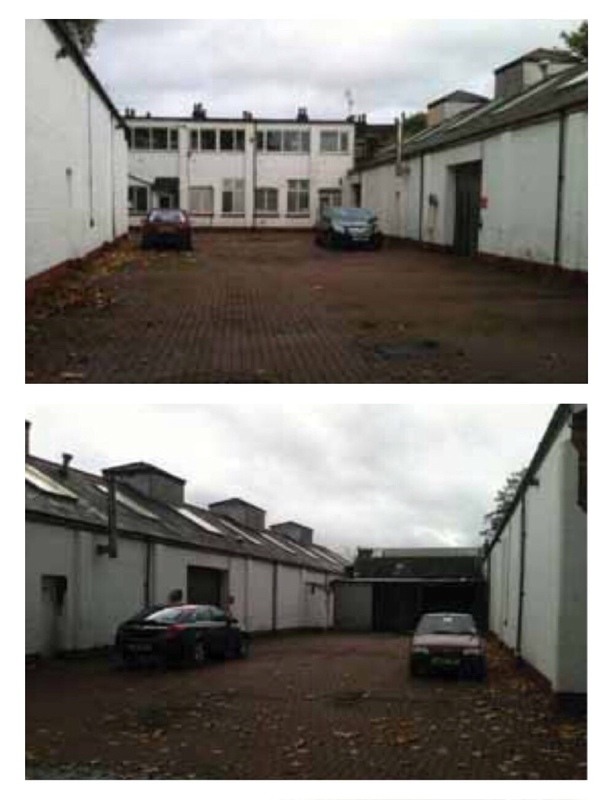 Many of sites used by the firm were sold or relinquished as the need for stables disappeared. The Shooters Hill Road site has been given up by 1914 (1). Old Road was retained though, changing from a stables to a small coach works. The other main local site at the time was Salisbury Yard, behind the Sailsbury pub on the High Street which was the main local garage until Tillings took over Catford Bus Garage in 1920. Salisbury Yard, became a bus factory, known as Obelisk Works. Tillings stayed in Old Road until the late 1920s. The remains of the stables though were visible until the housing started to be developed around 2015, they are pictured to the right in the Planning Application for the site. After Tillings moved out the new occupants from 1929 were J Whitehouse and Co, who were Confectionery Contractors. Sadly, little is known about the company, they certainly weren’t a well known brand and presumably made either for others or loose, unbranded chocolates and sweets. One local memory of the factory was of a neighbour in Aislibie Road, when the former neighbour was a child they recalled being given free toffee through a now bricked up doorway. Whitehouse and Co remained in Old Road for almost 30 years, they were still listed in the 1948 Kelly’s Directory, but had gone the following year. The reasons for their departure aren’t certain. However, like all sweet manufacturers they are likely to have struggled during and after World War 2. Sweets and chocolates were rationed, with allowances varying between 16oz (454g) and 8oz (227g) per month from 1942 during the war, and 12oz (340g) after 1945. The site seems to have been empty for several years but was then taken over by John Edgington and Co Marquee Manufacturers. Unlike their predecessor, it is a company that has a well documented history. The roots of the company go back to the early 19th century – there were three linked companies all carrying out a similar business in relation to marquees, tents, flags and related products. It started with two brothers Benjamin and Thomas who set up a partnership around 1805; the partnership was dissolved in 1823 but the trade continued in two separate companies. John Farncombe Edgington was the second son of Thomas, his older brother, also Thomas started his own, business which John assisted with. John was born in February 1817, his father had been working in Tooley Street in the canvas trade since 1805. By 1832 Thomas’ business was operating from 108 Old Kent Road – a location where the firm traded from until the Bricklayers Arms flyover was built in the late 1960s. Business grew rapidly with the opening of railways and the use of tarpaulins on trucks. They had high profile clients for their tents in the the shape of Dr. David Livingstone’s first expedition. Thomas (Jnr) died of an unintentional poisoning in 1852 and his father five years later. This led to John taking control of and merging both the businesses by 1862. John Edgington only lived for another 8 years, he died of pneumonia and exhaustion in 1870. The name though was to live on for another century. The firm was run subsequently by the Hilton family, who were business partners of John Edgington – they supplied Scott’s ill fated expedition to the Antarctic. From the late 19th century there was a rather macabre part to their business – suppliers of the rope used hangmen. 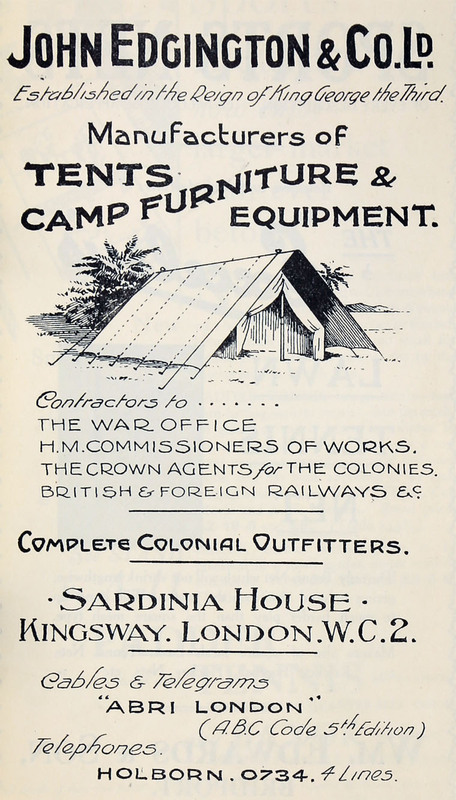 Adverts for their camping equipment appeared in the trade press, including this one in the 1929 British Industries Fair catalogue (via Grace’s Guide on a Creative Commons). In October 1976 the firm indirectly reformed the single company set up by Thomas and Benjamin in 1805. Benjamin’s firm had been bought out by the camping firm Black’s to form Black and Edgington in 1967. 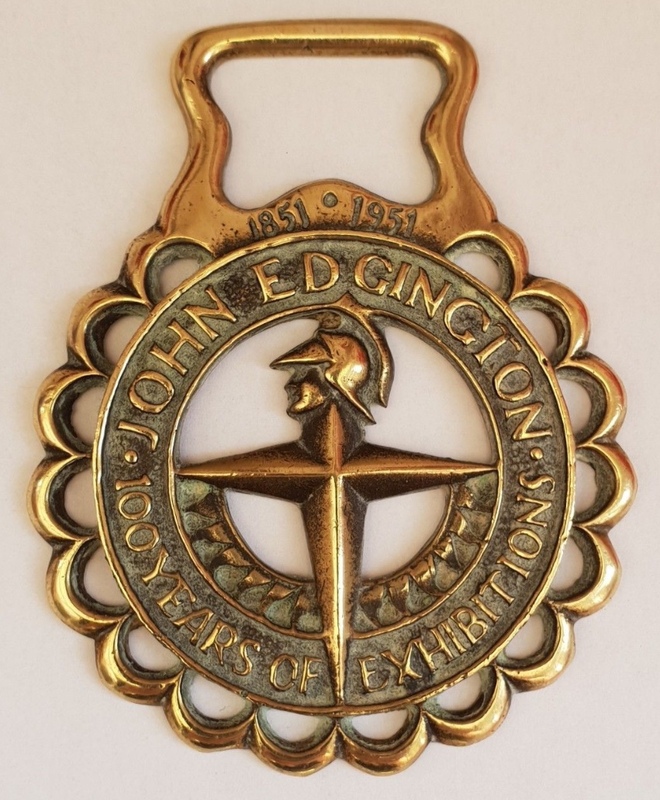 The successor of Thomas, John Edgington and Co merged with Black and Edgington in 1976. 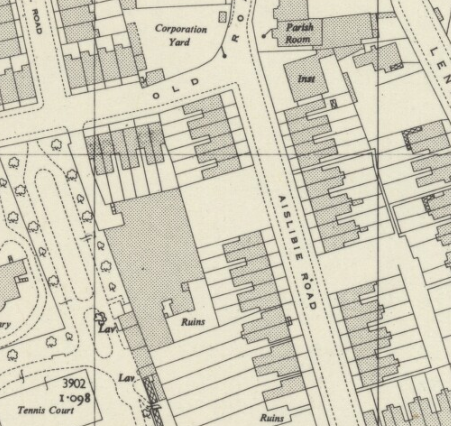 The partial move to Old Road was around 1955; the site seems to have been empty since 1949 (there are no entries in the Kelly’s Directories for the intervening years. ) In the early years it was listed as “John Edgington and Co Marquee Manufacturers”, presumably carrying out some part of the core business. Oddly, they weren’t mentioned in 1960 and when the listing reappeared in 1965 it was listed as a workshop for John Edgington (Exhibitions) Ltd. Their work included making floats for the Lord Mayors Shows. The footage from 1980 may well include floats constructed in Old Road. The exhibitions section had been set up in 1851, a centenary was celebrated in 1951, oddly with a horse brass (source eBay September 2018). Edgington’s remained in Old Road until the late 1980s when, Penfolds Motors who had sold their site at Lee Green to Sainsburys, bought a series of sites in the area – including this one for crash repairs, and, 100 metres away a showroom on the corner of Bankwell Road and Lee High Road. Running Past will return to Penfolds at some point in the future, but if the pause button is ever taken off the housing development, this is what it will look like (Source – Planning Application). This entry was posted in Lewisham History and tagged 36 Old Road, Cedar House, J Whitehouse and Co (Confectionery), James Halliburton Young, John Edgington (Exhibitions) Ltd, John Edgington and Co Marquee Manufacturers, Obelisk Works, Pefolds, Penfolds (Vauxhall), Sailsbury Yard, Thomas Tilling on December 6, 2018 by Paul B.